1) "I can't access the Internet using either Edge or Chrome." 2) "Am unable to print from computer to my Brothers printer." 3) "This afternoon I had a call from someone with an Indian accent who tried to get me to let him fix my computer." There are lots more reasons, too. You can see more reasons by clicking the "Reasons" block below. This week's Question is important so please take a few minutes to read it. Also, if you're on Florida's Treasure Coast, we hope you'll join us this Saturday for our live seminar! Reasons People logged in to RTS this past week! If you live on the Treasure Coast, our April seminar is THIS Saturday, April 14, 2018. The cost is still just $8 a person and there'll be coffee, tea, juice, donuts and other goodies so come a few minutes early! For the last two weeks, we've been advertising Otterbox smartphone cases. Here's your chance to buy one and get another at half price. But, this offer is only good until April 15, 2018 so act fast. Just click on the link below! Question: "I use pictures off the Internet as backgrounds for posters and other printed materials. Sometimes, I find the perfect picture but it has light writing "in the background" and often, that makes the picture no good for what I want. Why do some photos have that faint writing in the background?" Answer: To illustrate our answer to this question, we've included two pictures that are actually the same picture but one has light writing in the background. The photo above has the background writing and photo below does not. First, if you aren't aware of the terminology, the faint writing in the background of a photo is called a watermark. The purpose of the watermark is to prevent people from using the photo without paying for its use. The photo above has an Adobe watermark and is used to show you what the picture will look like before you purchase it from Adobe. The watermark is to prevent you from using it without purchasing it. What does it cost to purchase a watermarked photo and have the watermarked removed? That's the Microsoft Answer - it depends. It depends on who's selling the photo. Additionally, there may be restrictions on how or where you may legally use the photo even after you've paid to have the watermark removed. You should read the agreement carefully before you purchase a watermarked photo. 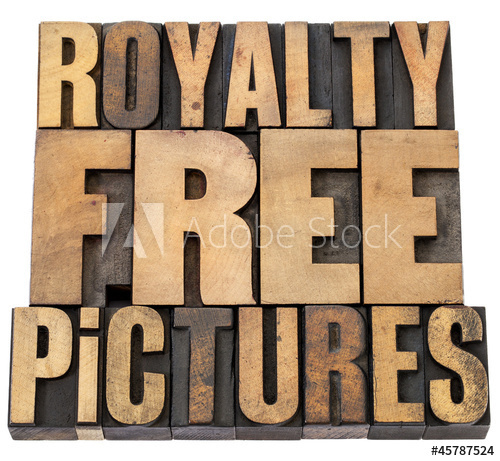 One last thing: in the photos here, you see the term Royalty Free. Royalty Free does NOT mean you can have the photo for free. It means that after you purchase the photo, you may use it wherever the owner allows you to use it without paying any further royalties. For the record, we have a subscription to Adobe Stock and that allows us to download and use up to 10 photos a month for the monthly subscription price.